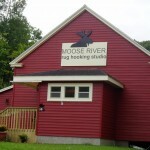 We are very excited to share that a few local friends of ours have recently opened the MOOSE RIVER Rug Hooking Studio in Clementsport, Nova Scotia. The studio will be a place for seasoned hookers to hang out and share stories and techniques, as well as a place for those who want to learn the skills required to learn from the best. They will also be able to supply you with much of the required equipment needed to achieve the best results. The studio is located just 10 minutes from Annapolis Royal and we would be happy to put a package together for you including accommodations if you are interested in taking in one of the many workshops that they will be offering.